A controversial plan for a road tunnel past Stonehenge has been finalised by the government. Campaigners claim the 1.8-mile (2.9 km) dual-carriageway tunnel will cause "irreparable damage" to the landscape. However, Transport Secretary Chris Grayling said the plan will "transform" the A303, "cutting congestion and improving journey times". A public consultation to get the views of drivers and residents will run until 5 March. The busy A303 currently passes within a few hundred metres of the ancient monument. The tunnel forms part of a £2bn government scheme to upgrade all remaining sections of the road between the M3 and M5. However, campaign group Stonehenge Alliance believes any tunnel shorter than 2.7-miles (4.3 km) would do "irreparable damage to the landscape". Chairman of Amesbury Museum and Heritage Trust, Andy Rhind-Tutt, described the tunnel plan as a "self-destructing time bomb" which would "do nothing" for traffic problems in the area. In 2015, a Stonehenge Alliance petition calling for a longer tunnel gained 17,500 signatures. 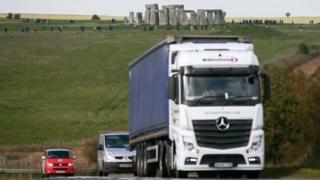 In a statement, the group said: "The Alliance does not advocate new road building at Stonehenge, but accepts the need to improve the tranquillity and appearance of the World Heritage Site and its setting. "If the government insists on widening the A303 by means of a tunnel, it must be sufficiently long to avoid any further damage to [Stonehenge] and its setting." English Heritage and the National Trust have also given their support to the option of "the longest tunnel possible". Highways England's Jim O'Sullivan said: "Our plans for the A303 recognise the national importance of the route and these improvements will bring real benefit to the region and local communities. "The public exhibitions will provide an excellent opportunity to explain further our plans and to hear feedback from stakeholders." However, a report by UNESCO and the International Council on Monuments and Sites has recognised the benefits of the project. Plans for a tunnel past the Stonehenge site have had a long and chequered history. Proposals for a bored tunnel were first mooted in 1995 but the government insisted on a "cut and covered" tunnel, which was unveiled in 1999. The plans for the 2.5-mile (4 km) tunnel was criticised by the National Trust and other groups who were concerned about possible damage to the site. Following a public inquiry, the tunnel scheme was withdrawn in 2005 by the Labour government, partly due to rising costs of construction, which had doubled to £470m. It was shelved for good in 2007. The idea resurfaced in 2014 when the Conservative MP for Salisbury, John Glen, said any attempt to make the A303 in to a dual carriageway must include protection for the World Heritage site. In December of that year the coalition government gave its support to the plan for a 1.8-mile tunnel near the monument. Stonehenge is one of the Europe's most recognisable prehistoric monuments. The history of the Wiltshire site dates back 4,500 years and it is the only surviving lintelled stone circle in the world.